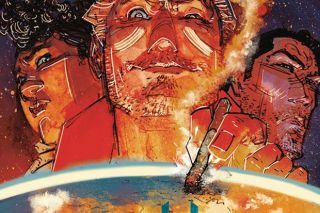 The universe isn't in great shape in Vault Comics' "Wasted Space," but the future for the comic itself is brighter future than ever as it expands from limited series to ongoing this week. Writer Michael Moreci and artist Hayden Sherman's recalcitrant rock star prophet Billy Bane is back, and while he may not be able to save the universe, he can try to save his friends — and get revenge on the Creator who caused all this mayhem. With the first collection on shelves now and the next arc beginning this week, Moreci spoke with Newsarama about this new beginning for this cosmic end times series. Newsarama: Mike, I believe this is your first interview following "Wasted Space" transitioning from limited series to ongoing. Did you have this idea for it to expand in your back pocket from day 1, or did things change once Vault broached the idea of opening it up? Michael Moreci: I had an idea for a much longer series that I knew how to truncate. In fact, truncation was the plan — we were ten issues and done. And it would have worked. But doubling that count (the plan is 20 issues, at least) gives me the space to stretch and really cover some ground that I think is worth covering. It lets me go deeper and do a few things — particularly with the character arcs — that I otherwise would have had to skip. I've always known the ending — I know exactly where we're going; now I have the space to make that conclusion, and the journey to it, even more powerful. Nrama: Billy Bane doesn't seem like someone who will live to old age - I might be wrong there, but what keeps him going now as we head into this week's #6? Moreci: I think Billy is a guy who, deep down, wants to be redeemed. He just doesn't know how. He's constantly at war — with the people around him, with the Creator, with the galaxy, but mainly with himself. At this point, while he wants redemption, he doesn't think he deserves it; he doesn't think it's obtainable. But in lieu of not being able to achieve that, what keeps him going is taking down the Creator so he can never do to anyone else what he did to Billy. Nrama: "Wasted Space #1" opened with the universe pretty dire. Have things improved going into #6? What's changed? Moreci: What's funny about "Wasted Space," and one of the points I'm trying to make, is that the universe at large doesn't matter all that much. It does and it doesn't. The world around you is always going to be in some kind of turmoil or other — that's just how things will always be. If you wake up every day looking for strife in the world, looking for people with horrible thoughts and opinions, you will never be disappointed. That said, "Wasted Space" is more about tackling the smaller picture. I think it was Emerson who said "Create better people and the rest follows," and that's stuck with me my entire life. Because it's so true — if we cultivate goodness within ourselves and those closest to us, we'd see change. We'd see things get better. And that's what "Wasted Space" is about; so much sci-fi is about The End Of The World, and while it may feel like the world is ending all the time, so far it hasn't (fingers crossed, right?). So as long as we're still around, I'm looking more at trying to understand what it is we owe ourselves and each other in the blink of an eye that we exist. Nrama: After that initial arc, what would you say Billy's vision of success would be? Moreci: Billy wants to have his cake and eat it, too. He wants to maintain his rigid cynicism, but he also wants to do something good for the people around his — for the entire galaxy, maybe. He cares, deeply, about his friends and everyone else — too deeply, probably, and that's what makes him so angry and bitter. And like I said, his only way out, in his eyes, is revenge against the Creator — and liberation, in the Creator's absence, for everyone else. Nrama: Where's everyone else at with the onset of #6? Molly, Legion, Dust, Fury...? Moreci: Right now, the gang's experiencing a bit of an uncomfortable alliance now that Fury is sorta part of the team. Her and Dust make for quite the pair, and it bugs Billy just a bit. Molly's going to really come into her own in these issues, and she's going to eventually become front and center of the story very, very soon. Right now, she's the rock of the group — which is funny, since she's lived the most sheltered life of them all and has basically no real-world experience. Which goes to show what a wreck everyone else is. And of course there's Legion, who's change of heart at the end of issue #5 will have... consequences. Nrama: You're entering into your second arc here with Hayden Sherman, who for years has seemed to be an artist just waiting for a breakout project. Now that you've got five issues of him turning your scripts into your art, how are you dialing in the scripts more attunely to what he can do? Moreci: Hayden is one of the best artists working in comics. Full stop. I just need to say that. I adore his work, I love him as a person, and working with him has been a joy. And now that we have this rhythm, I know that I can give him room to roam. I don't need to describe things too deeply; sometimes, I don't even need to get too deep into the story action. He's so good, and he knows the "Wasted Space" universe just as well as I do, and I enjoy giving him as much opportunity as possible to make every issue his own. Nrama: What are your big goals for "Wasted Space" now as an ongoing? Moreci: Honest, I just want to maintain the integrity of story and its execution for the next whoever many issues this thing runs for. We've been lucky — very lucky — to have our weird little space opera met with so much acclaim and market success — and I'm so grateful for both — and I want to maintain what's made this series so special. The last thing I want to do is overstay our welcome. That said, I still have some surprises up my sleeve, some cool stuff I can't wait to do, and I want to see it all build to a satisfying conclusion when all's said and done.